Saturday, October 27th, Qualbe Marketing Group employees and their families will gather to start building beds for children who need them in the DFW area. FORT WORTH, TX, UNITED STATES, September 25, 2018 /EINPresswire.com/ — On Saturday, October 27th, a group of white collar workers will trade their keyboards and headsets in for a box of hammers and a pile of 2x4s to start building beds for impoverished children in DFW. “We’re builders — We build up businesses and we build up people. 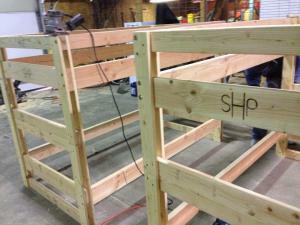 Now we’re building beds to help the kids in our community get a better night’s sleep! When we heard there was an organization building beds for kids who don’t have them, we wanted to be apart of that,” said Randall Meinen, Founder and CEO of Qualbe Marketing Group. On “Build Day,” Qualbe employees and their families will fill the company warehouse to build 20 bunk beds for children in need in Dallas-Fort Worth through the organization: Sleep in Heavenly Peace. The company is raising money for the event. Each bed made will be delivered and assembled at homes in DFW, complete with mattresses, pillows and bedding. According to Dallas News, one in five children in North Texas live in poverty, many of whom are without a bed of their own. Kids need a good night’s sleep, and a good bed provides that. Qualbe Marketing Group is a digital marketing company in Fort Worth primarily focused on selling and marketing dental discount plans under the brand 1Dental. It also provides digital marketing services to other prominent businesses in the area.